Nice to know about the book and the cook together event. I am sure it must have been loads of fun. Also I do agree about the pathetic state of Indian restaurants in and around Boulder. I am looking forward to your posts with the recipes from the book. do you have a picture of the feast you all put together? I would LOVE to see that! One of the highlights of my life was a recent cooking tour of Kerala. I loved the food there and attempt to recrate it at home, where it never fails to make me happy. I too am cultivating the way of cooking by touch/feel, but as not a Kerela native I can say it sure is great to have well-written cookbooks to give me a launching point. The December meal sounds wonderful. i too have seen ammini on forums and have some of her recipes and tips. this book is definitely coming to my home. thanks, and looking forward to your series. Thanks Manisha for all that wonderful info on the new book. Are there lots of pictures in the book. I haven't seen a kerala food book with pics and would love to have one. I hope this fits the bill. Deepz, this was the first time that I was 'managing' 4 very accomplished cooks. I don't have half the experience or knowledge they do. It was a tremedous learning experience on all fronts. 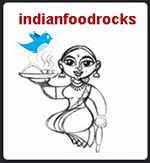 I've been told that the Indian food scene is better in Aurora or Denver so we need to do that soon! HKG, you must! It will resonate well with you because Kerala food is a lot like Maharashtrian food in its simplicity. Nabeela, my friend Lee took a few pictures. I was just too busy to take any. I will upload them as I post the recipes. Lee was cooking right along with me so they are at best, point and shoot pictures. But I am so glad she did! Diane, congrat! I am sure you will enjoy it. I've been learning so much from the book, too! Bee, I keep saying I am on a Kerala food high. And this is vegetarian cooking at its best! Gini, Ammini's strength lies in her writing and her knowledge of Kerala's culture and traditions. The book has some pictures but it is not a recipe book with glossy pictures alongside each dish. She has pictures of ingredients and spices, wherever relevant. Her writing evokes visuals that are very powerful and very honestly, this is the first book in which I have not missed having pictures. Thanks for your suggestions regarding the sue of farina :). This is my first time on your blog-loved this post. And now I'm late! (Well the Airtel broadband went under last evening, not to surface till now, 20 hrs later) And you're on a spree! So, you think four women can cook together in the same kitchen? Hmmm...I used to find two too many! :) But, jokes aside, I wish my friends lived close and I could do this. I have just two friends ,other than the ones I have acquired virtually very recently :), and both of them are great cooks. Musical, welcome! I prefer farina to regular rava. I generally use farina or cream of wheat to make upma. Recently I found cream of wheat with barley in it. It tastes just a little different but we loved the flavor. Anita, it's never too late to hear from you! 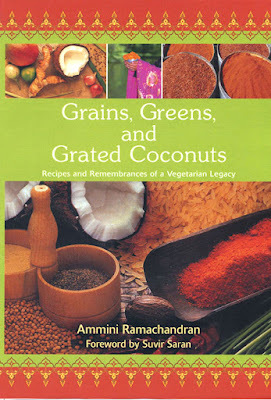 Ammini's book has me cooking and enjoying vegetables! What can I tell you? The recipes are quick and the results very flavorful! I love avial, too! I haven't ventured into making appams. I will soon be getting a puttu maker to make puttu. Four women? We were five, including me! Two were very new friends at that time - we met because of my lemon pickle! The other two are women I have known longer. But that really didn't matter as we all got along so well together. We worked very well together, too. I have a 5 burner gas stove but we couldn't use more than 3 at a time because the pots we were using were large. Lee brought her induction burner with its special magnetic pots and that turned out to be a life saver. Everyone pitched in with grocery and supplies. I didn't have enough katoris so Lee and Charlotte brought rice bowls and ramekins. My dining table hadn't yet been delivered so we put tablecloths, courtesy Lee, on two 6' picnic tables and my guests brought extra chairs to sit on! We split the tasks and each one had a dish they were in charge of or coordinating. Everyone tried their hand at making rotis. It was a blast! I want to have another cook together soon. And, this time I will have enough katoris! I think it worked because each one of us was eager to learn from the others. There were no egos that needed to be fed so we didn't get on each others' nerves. It was a very productive environment. It was also the closest I have come to a meal with extended family - my friends are my family - in a long long time. I totally agree - cooking the okra on high heat without covering the pan ensures non-slimy results :) And that cookbook looks like one I'll want to add to my collection tout suite! Shyam, glad you concur about okra! I am sure you will enjoy the book. It is not a glossy coffee table recipe book. Instead its pages are filled with recipes, stories, festivals, traditions and history of Kerala. Resham, farina is the same thing as cream of wheat. It is more coarse than semolina or rava or sooji. There is a slight difference in taste but we like it a lot so that hasn't been an issue for us. I follow the same procedure for upma with rava but I use less water. The amount of water also depends on how many veggies I tossed into the upma so I just eyeball it and add water accordingly. I don't go by the instructions on the packet.